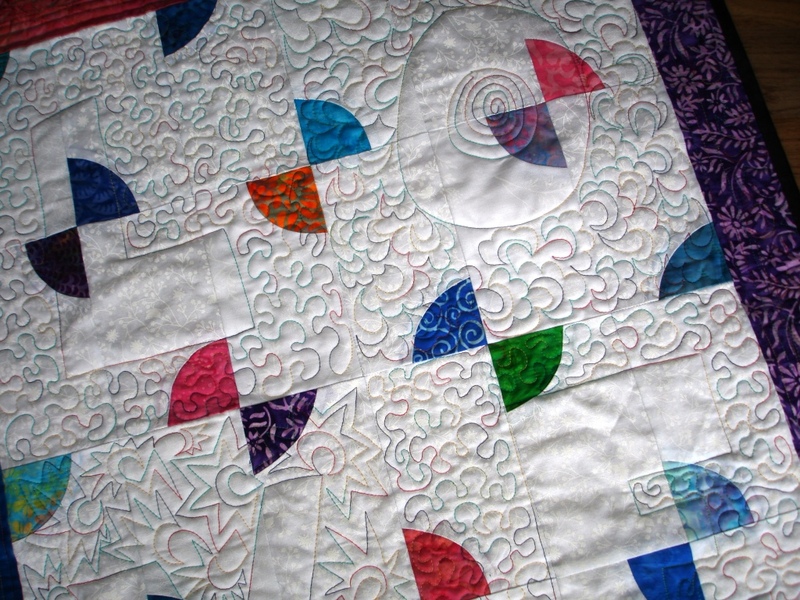 The Auckland Modern guild is running a challenge: to create a basinette quilt of approx 20x24" using a block or design that you haven't used before. Entries to be donated to Starship Hospital’s NICU (Neo-natal Intensive Care Unit) or PICU (Paediatric Intensive Care Unit). How on earth do you change font size?? 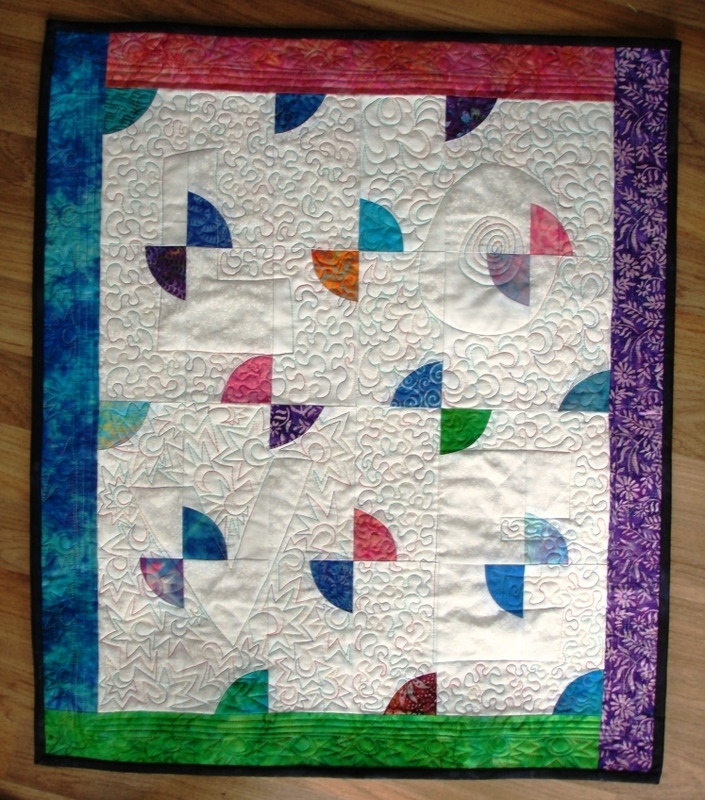 I used the remains of the batik jelly roll I used for my nephews cot quilt to create both the rainbows/butterflys and border. A few leftover bits of white on white for the background. Had a bit of fun with the quilting... incase you can't read it, it spells LOVE - and now I can't claim that I've never done stippling before... although I'd much rather use a different sort of filler - it is way boring and too easy to get stuck in corners with. Variegated Aurifil thread 50wt. Also did three rows of freemotion straight line quiting - didn't turn out as bad as I thought it would... however, it was also very boring to do. 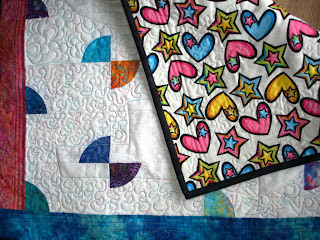 A bit of a fun and funky backing... one of Nadia's fabric choices left cluttering up my stash. I'd never done a drunkards path block before... and certainly never with freehand cut circles. The blocks are also rectangular, which gives it a point of difference. I've got it hanging on the line and will post it off tomorrow, to hopefully arrive before next Tuesday. In other news, I've spent quite a bit of time cleaning up my quilting space and reorganising stash, storage, threads and all the bits in between. As Nadia and I share space... we now have better defined areas so I won't keep taking over her space. Although, sometimes she does take over my space too. A few more small units have been constructed towards the March Swoon block... but all in all, a pretty poor effort to date. With school holidays looming from the end of the week, I am hoping that some quality quilting time will improve matters on the BOM front and it would be nice to not only get April's blocks completed, perhaps even catch up with the March ones?? Lovely & colourful a special wee one. 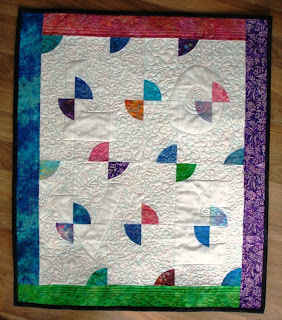 Love (sorry, pardon the pun) the quilting, and the way the butterflies seem to float. Very nice. There's Progress Jim, but not as we know it.